Sigh. Hugh Jackman is simply the best. Truly. I saw Wolverine over the weekend and my stars, I am in love with him. Yes, I know he is married and has two kids, but a girl can dream, can't she? Although he is my friend Aixa's #1 on her freebie five, so maybe I would settle for Liev Schreiber, who also put in a great turn as Sabretooth. 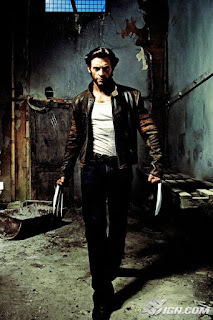 I know the movie didn't get stellar reviews, but not every comic book movie is going to be a "Dark Knight", and for what it was, "Wolverine" did a great job. It pulled you in right away and kept you going until the very end. Will.i.am, Taylor Kitsch, and Ryan Reynolds round out a great supporting cast with Taylor Kitsch's Gambit my favorite of the three, although Ryan Reynolds had the best lines. It moved fast - before I knew it, the movie was over. Start time was 12:50, with previews and all, it probably started close to one and I was out of the theatre and into the afternoon sunshine by 2:40. Not even a 2 hour movie. So what are you waiting for? Since this is a prequel, even if you've never seen an X-Men movie before, you can jump right in. Come on - look at that picture. Why wouldn't you pay $8.00 to spend almost 2 hours watching him on the big screen?